Planning your dream wedding can sometimes leave you wondering where all the money has gone. Getting all the elements of your perfect day can add up and get expensive. So what do you do if you are on a budget and finding it hard to fit everything in? We have some top tips for you when planning a wedding on a budget. So read on to find out how to splurge and save on the right areas so that you get the most out of your money. The trick to saving money on your wedding day is to make sure you plan and budget. It may sound boring and something you don’t need to do but it will help in the long term. Finding out how much you have to spend on different areas will make sure you get the most out of your money. Do a little research on ballpark figures to work out how far your budget will stretch. Before you go wedding dress shopping, have a budget in mind. Tell the boutique what your price range is and they will be sure to show you dresses within this. There is nothing worse than falling in love with a beautiful dress and being unable to have it. Everything else will feel inferior to you so don’t go in blind. We have British designer short wedding dresses in a range of prices to suit every bride. The Timeless Chic range is our in-house tea length wedding dresses with a modern twist. Anara is one of our gorgeous vintage style wedding dresses with a lace bodice and no sleeves. 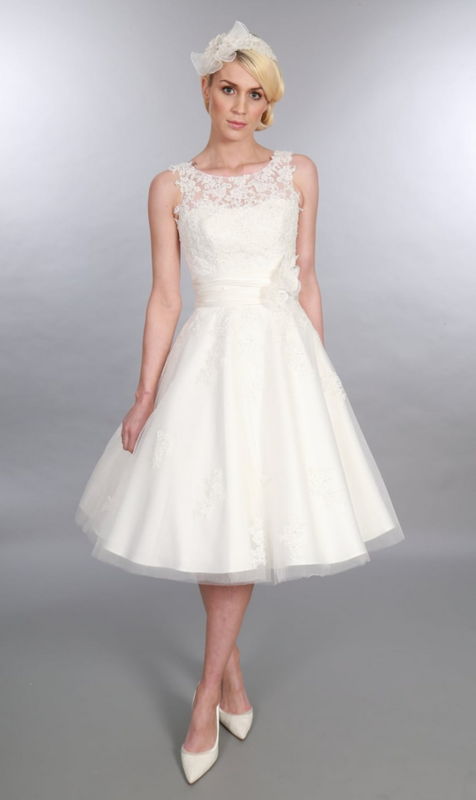 The full 1950s style skirt is tulle with lace embellishment and finished with a flowered sash. If you are working to a tight budget then think about your wedding guests. This all has an effect on the size of your venue and food / drink costs. So perhaps you could keep it to close family and friends during the day and more people for the party in the evening. If you have a large family or want to spend your money this way then think about having a reception in a garden or local hall. The same goes for your wedding party, work out who you need as bridesmaids or grooms men. Remember the more you have the more expensive it gets so a select few will keep you within budget. Having DIY details such as food or decorations can keep your plans and budget on track. Instead of presents, maybe ask family and friends to donate their time to helping in the run up to the wedding. Keep food costs lower with a buffet style lunch or BBQ which is a great option if you are having a retro wedding. A relative who loves baking may be interested in creating your wedding cake which would cut costs more. Keep flowers seasonal and this will work out cheaper. If you really want to keep costs down then arrange your own venue flowers and perhaps just get your bouquet from a florist. Button holes and bridesmaids flowers can be arranged by yourselves and there are lots of online tutorials to help with this. Remember to keep an eye on your budget throughout the wedding planning process. That way there won’t be any nasty surprises when your wedding day comes around. It’s good to work out what you can be flexible on or what are ‘must haves’ as this will make decisions easier. If you want to try short wedding dresses in your budget please contact us today. Book your one to one appointment where you get to try as many vintage style wedding gowns as you like. You’ll be the only bride to be present so that we can make sure your needs are catered for.